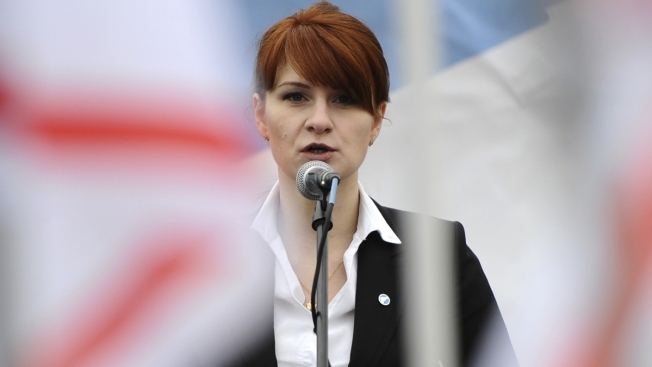 FILE - Maria Butina, a Russian spy who infiltrated conservative political groups in the U.S., speaks at a gun rally in Moscow, Russia, on April 21, 2013. The boyfriend of a Russian woman who admitted she was a secret agent for the Kremlin has been charged with fraud in South Dakota, the U.S. Attorney's Office announced Wednesday. Businessman and conservative political operative Paul Erickson, 56, pleaded not guilty Wednesday to 11 counts of wire fraud and money laundering, a day after he was indicted, according to the South Dakota U.S. Attorney's Office. He faces up to 20 years in prison for each count. The charges appear unrelated to the case of Maria Butina, 30, who pleaded guilty in December for trying to infiltrate conservative political groups. Prosecutors said Erickson defrauded "many victims" from 1996 through August 2018. The indictment accuses Erickson of concocting a variety of schemes to carry out well over $1 million in fraudulent transactions, including recruiting investors for a string of elder care homes; developing a wheelchair that allowed a person to use the bathroom from the chair; and home-building in North Dakota's booming oil fields. Erickson made false representations to get people to invest in the schemes, according to prosecutors. An attorney for Erickson didn't immediately return a phone message seeking comment from The Associated Press. Before his indictment, Erickson was caught up in Butina's high-profile case, which was separate from special counsel Robert Mueller's investigation into Russian meddling in the 2016 U.S. presidential election. Butina acknowledged she "sought to establish unofficial lines of communication with Americans having power and influence over U.S. politics," according to her plea agreement. She admitted that her boyfriend, Erickson, helped her as she tried to use his ties with the National Rifle Association to set up the back channels. It's not clear if Erickson will face charges in that case. As part of her deal, Butina pleaded guilty to a single charge of conspiracy to act as an unregistered foreign agent and she agreed to cooperate with investigators. In South Dakota, Erickson in 2015 helped arrange speeches for Butina to talk about freedom and entrepreneurship at a Sioux Falls school, at the University of South Dakota and at a teenage Republican camp held in the Black Hills. Arranging the events followed an unusual career for Erickson that included working on Pat Buchanan's 1992 presidential campaign and making an action movie with Jack Abramoff. Erickson served as national treasurer of the College Republicans while at Yale University. He graduated in 1984, got a law degree in 1988 from the University of Virginia and was executive producer of Abramoff's brainchild, "Red Scorpion," an anti-communist action film starring Dolph Lundgren.